Hardcover, 8.25 x 10.75 in. / 352 pgs / 250 bw. Edited by Stephen Squibb. Text by Adrienne Edwards, Laura Hoptman, Tom McDonough, Jenny Schlenzka, Susan Thompson. 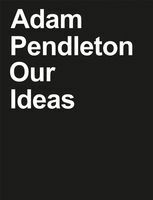 Black Dada Reader is a collection of texts and documents that elucidates “Black Dada,” a term that acclaimed New York–based artist Adam Pendleton (born 1984) uses to define his artistic output. The Reader brings a diverse range of cultural figures into a shared conceptual space, including Hugo Ball, W.E.B. Du Bois, Stokely Carmichael, LeRoi Jones, Sun Ra, Adrian Piper, Joan Retallack, Harryette Mullen, Ron Silliman and Gertrude Stein, as well as artists from different generations such as Ad Reinhardt, Joan Jonas, William Pope.L, Thomas Hirschhorn and Stan Douglas. The Reader also includes essays on the concept of Black Dada and its historical implications from curators and critics including Adrienne Edwards (Walker Arts Center / Performa), Laura Hoptman (MoMA), Tom McDonough (Binghamton), Jenny Schlenzka (PS122) and Susan Thompson (Guggenheim). 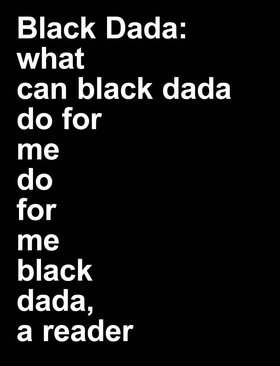 The subtitle asks “what can black dada do for me?” It behooves the entire art world to find out. FORMAT: Hbk, 8.25 x 10.75 in. / 352 pgs / 250 b&w.